Commissioned by Sultan Ahmed (1606-1617), the mosque was built by Mehmet Agha who is said to have toured key Ottoman monuments before he drew the plan of the blue mosque. This can be affirmed by the character of this mosque which came to embrace a number of ideas of his predecessors. The continuation of the domed based design, pointing out to the mystical nature of the religious conviction of the Ottoman leadership as well the splendour of their Caliphate, is the first indication of the architect's deep knowledge of the mosques reviewed above. 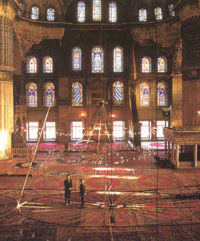 The adoption of similar spatial configurations consisting of the central space and the side galleries lit through the domes and curtain walls are all features borrowed from earlier mosques, particularly Sinan's Shehzade mosque. The only new design concept introduced in this mosque is the introduction of ablution taps under an outer gallery which runs along the length of the court. The plan itself is quatrefoil resulting from the subdivision of the square into four sides with its centre being occupied by the central dome, and its sides made by the semi-domes supporting it. The four majestic pillars supporting the central dome dominate the interior of the mosque despite the existence of galleries as found in Selilmiye and Sulemanye but here they failed to reduce the imposition of these pillars which are often compared to elephant feet. This approach was deliberate as the architect and his patron, Sultan Ahmed, attributed to these piers a symbolic significance referring to the four guided caliphs and close companions of prophet Muhammed (peace be upon him); Abu Bakr, Umar, Uthman and Ali. The dome above them symbolises the Prophet himself as the leader and radiant sun of Islamic faith. As in Sinan's mosques, the mosque was adjoined with a courtyard surrounded by galleries (Riwaks) covered with some thirty cupolas in total, but here it extends over an area the same size of that of the prayer hall. The prayer hall was adorned by four minarets, with three balconies, on the four corners. Two other minarets, of much smaller size and with only two balconies, were planted at the two end corners of the courtyard, clearly borrowing from the example of Suleymanye, progressing from a lower level to the higher one at the apex of the pyramid of the prayer hall as defined by the domes. Historic sources indicate that religious leaders of Istanbul objected to the six minarets arguing that the blue mosque should not be compared to Makkah Mosque (Al-HaramAl-Shareef) which also had six minarets. To overcome these critics, sultan Ahmed added another minaret to the Al-Haram. The mosque was nicknamed Blue Mosque because of the blue tiles, which cover more than three quarters of its surface. Tile panels presented over fifty different designs, all of which were made at Iznik or Kutahya at the orders of the Sultan. Historic sources reveal that some critics were raised against the huge expenses made on the building and decoration of the mosque. Calligraphy work, for example, was executed by the famous Ametli Kasim Gubari and mostly adorned with gold. The lavishly ornamented minbar was made from carved marble decorated with artichokes designs and crowned by a golden a'lem. Light lamps were covered with gold and ornamented with gems incorporating ostrich eggs, lustre and crystal balls. Ostrich eggs were known to work as repellent to spiders and other insects and were used by Sinan in Suleymaniya mosque. According to Mustapha Ali, a local medieval historian, the construction of the mosque and with such costs raised a lot of controversies in the Turkish-Ottoman population. He explained that the usual custom was that leaders build such structures (mosques, palaces and other public buildings) to commemorate a particular victory and the costs were usually met by the booties gained from such victory. However, blue Mosque was the first example when the leader built such costly mosque without any victory but from public funds. He further criticised the building of such project in time when poorer areas and smaller towns were neglected and had hardly any well maintained mosques, hospitals or public kitchens. Goodwin Godfrey (1971), op., cit. p.346. Ibn Batuta reported that the Great Mosque of Basrah had seven minarets, see Ibn Battuta (ed.1958), The travels of Ibn Battuuta, Ad,1325-54', translated and edited by Gibb, H.A.R., Cambridge Vol.II, p.277. I am indebted for my colleague Dr. Ayduz Salim for this information. see Von Gladib Almut, (2000), op. cit., p.560. Source for figures: M.Hattstein & P.Delius (Eds. 2000), 'Islam Art and Architecture', Konemann.p.560-1.